Everyone dreams about happy, sweet and romantic marriage, a marriage full of love, care and life. At times things turn out differently. Global increase rate of marital violence and divorce is alarming high. Courtship and marriage starts happier but in circumstances they run or end violently or with divorce. Married couples are responsible for happier growth of their marriage, whenever they leave room for evils; their marriage becomes a fiery burning furnace. Efforts to prevent and rescue a marriage on turmoil should be done as early as possible, unless otherwise, marital conflicts and violence grows up to difficult complications. 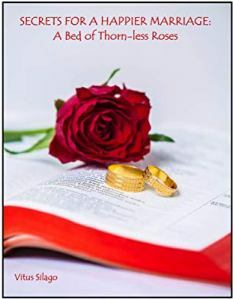 This book will give you highlights about your dream marriage; a happier, sweet and romantic marriage.